An assistant captain for the Red Knights in 2013-14 and a co-captain as a senior in 2014-15, Newhouse amassed 92 points on 17 goals and 75 assists in 112 games. 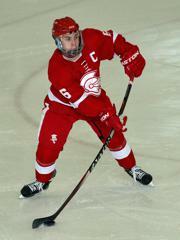 A member of BSM's Class AA state championship team as a freshman in 2012, he led the team in blocked shots with 53 in each of his final two seasons and was +86 during his career. Currently, Newhouse is sitting out the 2018-19 as a red-shirt following his transfer from Union College to Northern Michigan University. In two seasons for the Skating Dutchmen, he saw action in 38 games, registering three assists. Following his graduation from BSM, Newhouse played one season for Waterloo of the U.S. Hockey League, where he played 69 games, producing five goals and 19 assists and finishing the regular season with a +9 rating. This year's World University Games will mark the first time Newhouse has represented the USA in international competition. Ben Newhouse served as a Red Knight co-captain as a senior in 2014-15.